Personality: The Captain has an extremely mysterious and close-hearted personality. This is attributed to his characteristic of being utterly silent and never speaking, even if it be a laugh, grunt, or any voice/sound that comes out of the Captain's mouth. He does not talk and his expression rarely changes into anything but neutral, even in the faec of death. But as a monster, the Captain feels that living the life of an immortal from birth and watching his family and friends being slain because of his nature makes him want to give up on life and desperately seek death in the hands of someone worthy and powerful enough to take him on. He wears a full uniform which consists of an overcoat similar to a M42 Greatcoat with its neckguard constantly turned up and an M43 officer's cap emblazoned with the Totenkopf symbol. He has an early 30s appearance and a hard, neutral face. He has silver hair, red eyes, and an extremely fit body. Biography: Born in the 1840s in Germany as Hans Gunsche, the Captain is a full, pureblooded werewolf; having two werewolf parents. Traveling in a pack, he learned how to master his powers as well as understand his race's strengths, weaknesses, and enemies. At age 13, he witnessed his entire family slaughtered right in front of him by werewolf hunters armed with silver weaponry but he was saved from death by his parents and pack. Now a lone wolf, he wanders around by himself. The trauma of the memory made Hans very quiet and avoid talking with others. As he wandered around Europe with enormous supernatural power in his hands, he was constantly being pursured and attacked by werewolf hunters. But because he's strong, he was able to escape every single one of them and kill a few of his assailants as well. Now understanding that his kind is destined to be topped by humanity and they cannot die from age, Hans seeks the last werewolves to band together and fight the humans. At age 73, Hans evolved into an adult lycan who is fully able to shift into his werewolf wolf at will without the moon. Hans met another werewolf named Fegelein Ruptof who he took under his care and he became relieved that he is not the last of his kind. he was able to take care of Fegelein for several years until hunters came again and killed Fegelein but Hans was able to escape. Believing that he's now truly the last werewolf in the world, he finally gave up on living his life on happiness and seeks death. He became trained in the use of guns and military weaponry during World War I and during World War II, he becomes a Nazi. He quickly ranked up to the title of Hauptsturmführer (equivalent to the "Captain" rank) and is a well trained and disciplined soldier. For his abilities, he is sent to the Millennium Project as issued by Adolf Hitler to be a bodygaurd to a man now known as the Major. Millennium's head scientist, known as the Doctor, implanted a moniteration chip inside the Captain to moniter his behavoir upon being aware that he is a werewolf. The Captain becomes nearly mute as a result, making him unable to speak even if he wanted to. 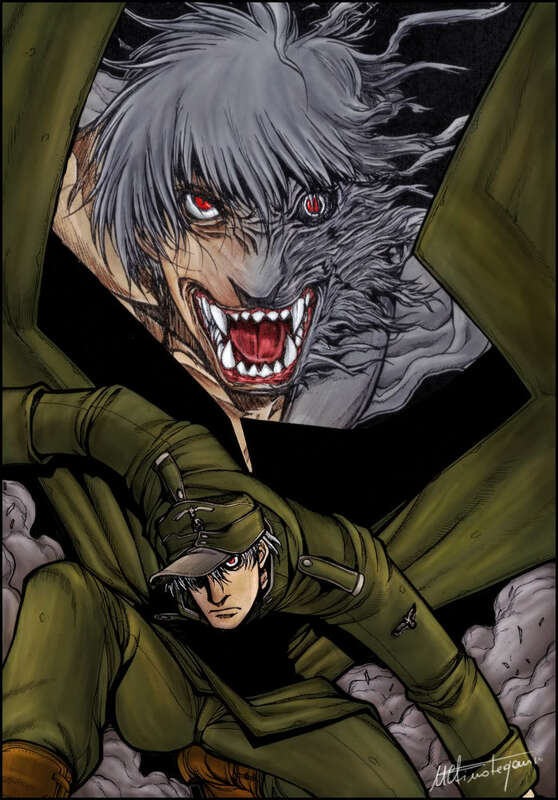 The Captain fought a 14-year old Walter C. Dornez as well as Alucard (also known as Dracula) during an attack on Millennium's main research facility in Warsaw during World War II. He squared off with Walter and managed to resist his wires, then choke him into submission before the fight was interrupted by Alucard. Alucard, on the other hand, backed out after getting kicked in half by the Captain who changed to his werewolf form and engages in a "monster vs "monster" duel, and left Walter to fend for himself while chasing after the Major. 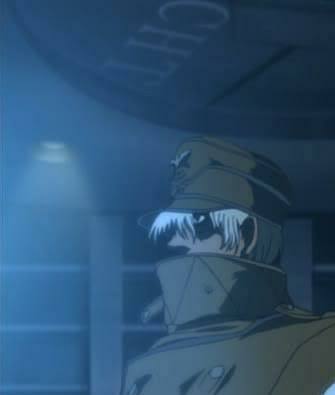 At this time, Walter came to an agreement with Millennium through the Captain and seemingly aided Alucard in destroying the facility, while he was actually helping the Millennium members escape and faked their deaths. Later in the same year, the Captain participated in the infamous Malmedy massacre on 17 December, during the Battle of the Bulge. He would ultimately travel with the rest of Millennium to South America and stay in hiding for decades. Over 55 years later, the Captain has long evolved into an Elder Lycan, which is the ultimate stage of lycanthropy there is. Now that he's in the highest class for a werewolf, he is a "true monster" and is worthy of being called a "Wolfman." He can fully access all of his werewolf abilities and transformations as well as being stronger while in human form. He can retain all of his power even if he transforms during the day or any time where the moon isn't present and can naturally turn into mist. He is still loyal to Millennium because he sees them as "monsters" and believes that they're able to bring him the death that the Captain has wished for so long. The Captain's strength and acrobatic prowess increases greatly, as he can easily break solid concrete and rip right through humans with no trouble. His skin's hardness is also near diamond. The Captain's strength, senses, and speed increases greatly that he can pretty much break through almost anything he wants. His very skin and flesh is also near impenetrable with probably the only thing that can seriously harm him being silver. Weaknesses: Silver- Silver can easily pierce through his body. The only way, or the most notable way, to kill him is to drive a silver object into his heart which would kill him. Super strength (can lift up to ten tons in human form- much higher in werewolf forms, rip through human bodies, and bend/crush steel bars easily), speed (the Captain can move at speeds that he appears as a blur or a flash of light), reflexes, senses (animal-like), agility, dexterity, balance, coordination, and durability (can withstand large explosions directly set off from missiles without being fazed). His skin/flesh is a lot harder than steel and concrete (while in human form) and can withstand razor sharp attacks even if they're tightened around his vital areas. 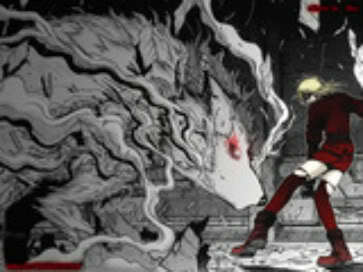 He can shapeshift into a mist-like form to reform or avoid attacks and damage as well as transform into a werewolf. His bones are strong enough to enable the Captain to fall from great heights without any damage. The Captain is immortal by age and has a regenerative factor that allows him to quickly heal limbs, organs, and wounds caused by silver that is not inflicted upon the heart area. The Captain has two modified Mauser C96s with incredibly long barrels,a combat knife, a first aid kit, as well as a small ringbox with a silver needle in it.